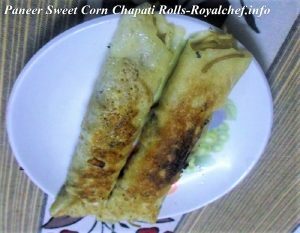 This is a Recipe for making at home tasty and delicious Sweet Corn-Paneer Rolls. 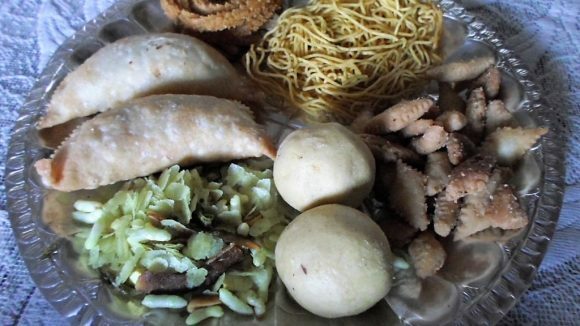 These Chapati Rolls, which are made using Sweet Corn Niblets, Paneer and vegetables like Bottle gourd and Turai are a filling dish that can be served for the main course or even in the tiffin boxes of school going children. For the Covering: Mix the Wheat Flour, Besan, Salt, Oil and Water. Prepare a thick Dough and keep it aside for 30 minutes. Then prepare 8 equal sized balls from the dough. For the stuffing: Wash and shred the Bottle gourd and the Turai. Boil the Sweet Corn Niblets, chop the Onion, Tomato and green chilies. Cut the Paneer into small size pieces. Heat the oil in a Kadai and add the chopped Onion, Tomato, Green Chili, Ginger-Garlic Paste and saute for a minute and then add the shredded Bottle gourd, Turai, Sweet Corn Niblets and saute for 2-3 minutes on a slow flame. Then add the Salt, Lemon Juice and the chopped Coriander Leaves. Mix it well and keep it aside. For the Paneer Roll: Roll one ball like a Chapati, heat the non stick pan and roast the Chapati from both the sides, remove the Chapati from the flame and spread two tablespoons of the mixture over the Chapati and roll the chapati. Prepare remaining rolls in the same manner. Then roast the rolls for 2-3 minutes on a slow flame by adding the Ghee. Serve the Paneer roll with Tomato Sauce or Chutney.